I'm convinced that everyone thinks they make the best scrambled eggs. They'd be wrong though, because these are the best. I'm also convinced that smoked salmon is the most delicious. thing. ever. Well, it's a toss-up between smoked salmon, cured salmon, baked salmon and grilled salmon. 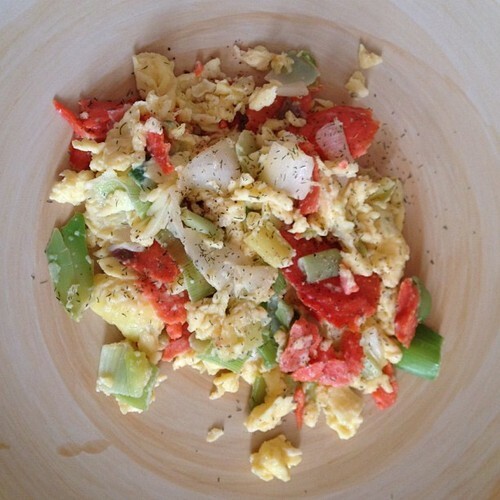 For breakfast one day I made this healthy paleo scramble and smoked salmon was the star ingredient. Scrambled eggs secrets coming your way! Heat ghee/oil. Throw the leeks in and let them sauté. While they are cooking, scramble some eggs with a pinch of cayenne. Take the leeks out of the pan and set aside. Lower the heat, add more cooking fat if you need to. Then pour the eggs in. Keep the pan on low heat and watch it. Patience, pet. Once the eggs start curdling, begin regularly pushing them around the pan. That's how you make super fluffy eggs—without dairy! Turn the heat up to medium. The best tool in my egg arsenal is one of those bamboo spoon-spatula things. If you want one too, you will have to buy in an Asian grocery store for like, $1 (or on Amazon for under $5). THE BEST. When they are about half cooked, flake off a few pieces of smoked salmon and throw the leeks back in. Let the eggs finish cooking. Sprinkle with salt, pepper and dill. Eat with an avocado if you're lucky enough to have one. I've got another recipe for smoked salmon here. Try adding tarragon instead of dill for change. What are your favorite scrambled eggs tricks?